This surely must be the one 'weed' which gardeners don't mind having in their gardens as its prettiness surely overcomes most resistance. Its slightly cup- shaped pale blue 5-petalled flowers (3-4mm across), with a yellow centre, are borne in cymes which uncurl as the flowers open, from April to September. The leaves are oblong and pointed and both these and the stems are extremely hairy. The basal leaves form a rosette. An annual plant, it grows to 25cm high. This is a native wildflower and it belongs to the family Boraginaceae. I first identified this plant in 1977 in Killiney, Co Dublin and photographed it in 2006 at Wellingtonbridge, Co Wexford. 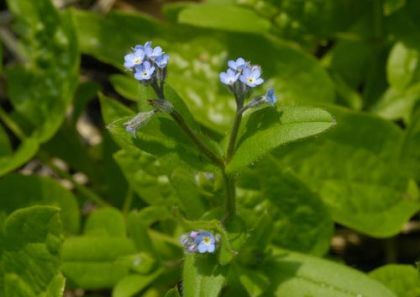 There are many legends regarding the name 'Forget-me-not'. One is that during medieval times, a knight and his lady were walking beside a river. He picked a posy of flowers for her but as he leant over to collect more, his heavy armour caused him to unbalance and he fell into the river where he started to drown. As she looked on in horror, he threw her the posy of flowers and shouted out 'Forget-me-not'. The name first appeared in French where it translated as 'Ne m'oubliez pas'. This flower has now been adopted by several associations including Newfoundlanders wishing to commemorate their fallen from the First World War, particularly the Battle of the Somme where so many were lost. 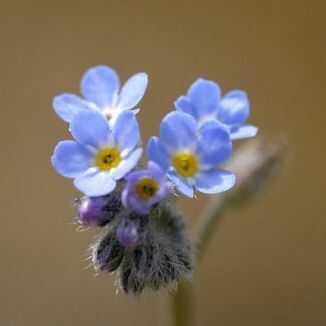 There are also several societies formed to help sufferers of Alzheimers Disease and their families and they have also used the Forget-me-not as their emblem.